Court Dismisses Latest Attempt To Acquire Kurt Cobain's Death Scene Photos : The Two-Way A Washington state court of appeals has rejected a conspiracy theorist's demand for graphic photos showing the Nirvana frontman after his suicide. 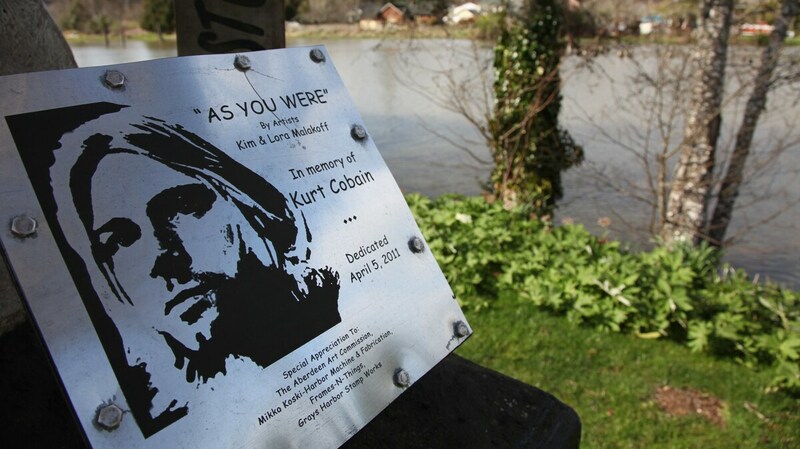 A sign in Kurt Cobain Park in Aberdeen, Wash., is seen in 2014. A Washington state court of appeals has rejected a conspiracy theorist's attempt to acquire photos of the death scene of Kurt Cobain, the beloved Nirvana frontman who killed himself in 1994. Richard Lee, who has spent years trying to prove that Cobain was murdered, has repeatedly asked the city of Seattle for access to the photos. A lower court had decided that the photos were exempt from state open-record laws, and that releasing them would violate the privacy of Cobain's widow, Courtney Love, and the couple's daughter. The court of appeals upheld that ruling. Seattle city attorney Pete Holmes welcomed the decision, King5 News reports. Holmes said he regularly advocates for opening records to the public, but he released a statement saying that death scenes are "out-of-bounds ... No one should worry whether they'll happen upon photos of a family member's body as they scroll through their social media feed." In the ruling, the appeals court was intensely critical of the legal arguments — or lack thereof — in Lee's case, which he filed without an attorney. Lee's failures to meet basic legal standards meant they could have dismissed his appeal in a brief opinion, the judges wrote. "Nevertheless, because of the near quarter-century of tenacity that Lee has displayed in pursuing his theory that Mr. Cobain was murdered, we believe it will suit the parties' interests for us to expound upon the wisdom and propriety" of the decision that keeps the death scene photos sealed, the court said. The court laid out legal precedent that holds releasing death scene images can violate the rights of family members, then quoted Cobain's family members describing the pain these images, which show Cobain's fatal injury, would cause. "Inevitably, these images will wind up on the Internet, where they would be permanently circulated," she wrote. "By virtue of the fact that Kurt is my late husband, they will also likely end up in search results about myself. I would unavoidably come across them, and I would never be able to erase those haunting images from my mind. I cannot even imagine the enormity of the trauma and mental scarring this would cause me, not to mention many others." Cobain's daughter, Frances Bean Cobain, told the court that she once saw fake photos of her father's body and the experience "irreparably scarred" her. "Those horrible images still haunt me," she said. The judge also denied Lee's requests to access a number of other documents related to Cobain's death. The documents were confidential, and Lee did not make compelling arguments for an exception, the ruling says. For instance, autopsies are confidential under state law. Lee argued that Cobain's autopsy report should be an exception, but he didn't provide any legal citations or "meaningful analysis," the judges found. You can read more about Lee's long quest for the photos in a story from KOMO News from 2015.